Greetings from Austin, Texas. My name is David Walker, and I will be posting here over the next couple of weeks to chronicle my participation in the second leg of the NOAA (National Oceanic and Atmospheric Administration) SEAMAP Summer Bottomfish Survey in the Gulf of Mexico. I leave for Galveston tomorrow and could not be more excited. About Me: I am about to begin my sixth year as a high school teacher at the Liberal Arts and Science Academy (LASA) in Austin, Texas. LASA is a public magnet school which draws students from the entirety of Austin Independent School District. Currently, I teach three courses — Planet Earth, Organic Chemistry, and Advanced Organic Chemistry. 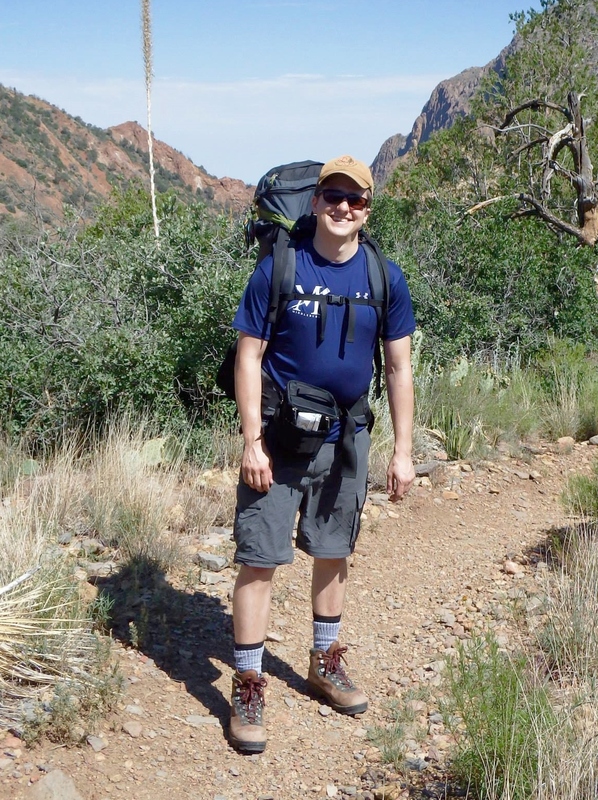 Planet Earth is a project-based geobiology course with a major field work component, which consists of the students completing field surveys of organisms in local Austin-area parks and preserves. Organic Chemistry is an elective course which covers the lecture and laboratory content of the first undergraduate course in organic chemistry. Advanced Organic Chemistry is an elective course framed as an independent study, in which students address the content of the second undergraduate course in organic chemistry. I also sponsor our school’s Science Olympiad team, and we compete around the nation in this science and engineering competition. This year, LASA Science Olympiad placed third in the nation, this representing the best any team from Texas has ever performed! Outside of teaching, my interests include backpacking, fly fishing, ice hockey, birding, record collecting, photography, dancing, and karaoke, in no particular order. About NOAA: The National Oceanic and Atmospheric Administration (NOAA) is a scientific agency of the United States government whose mission focuses on monitoring the conditions of the ocean and the atmosphere. More specifically, NOAA defines its mission as Science, Service, and Stewardship — 1) To understand and predict changes in climate, weather, oceans, and coasts, 2) To share this knowledge and information with others, and 3) To conserve and manage coastal and marine ecosystems and resources. NOAA’s vision of the future consists of healthy ecosystems, communities, and economies that are resilient in the face of change [Source — NOAA Official Website]. About TAS: The Teacher at Sea Program (TAS) is a NOAA program which provides teachers a “hands-on, real-world research experience working at sea with world-renowned NOAA scientists, thereby giving them unique insight into oceanic and atmospheric research crucial to the nation” [Source — NOAA TAS Official Website]. NOAA TAS participants return from their time at sea with increased knowledge regarding the world’s oceans and atmosphere, marine biology and biodiversity, and how real governmental field science is conducted. This experience allows them to enhance their curriculum by incorporating their work at sea into project-based activities for their students. They are also able to share their work with their local community to increase awareness and knowledge of the state of the world’s oceans and atmosphere, and current research in this field. The Oregon II research vessel was built in 1967 and transferred to NOAA in 1970. Its home port is Pascagoula, Mississippi, at the National Marine Fisheries Service (NMFS) Mississippi Laboratories. More information about the ship can be found here. The Chief Scientist for the survey is Kim Johnson (NOAA Biologist), and the Field Party Chief for my leg of the survey is Andre DeBose (NOAA Biologist). According to Ms. Johnson, the survey has three main objectives — shrimp data collection, plankton data collection, and water column environmental profiling. 1) Shrimp data collection involves catching shrimp in a 40 foot shrimp net, towed at 2.5 knots. Caught shrimp will all be weighed, measured, sexed, and taxonomically categorized. 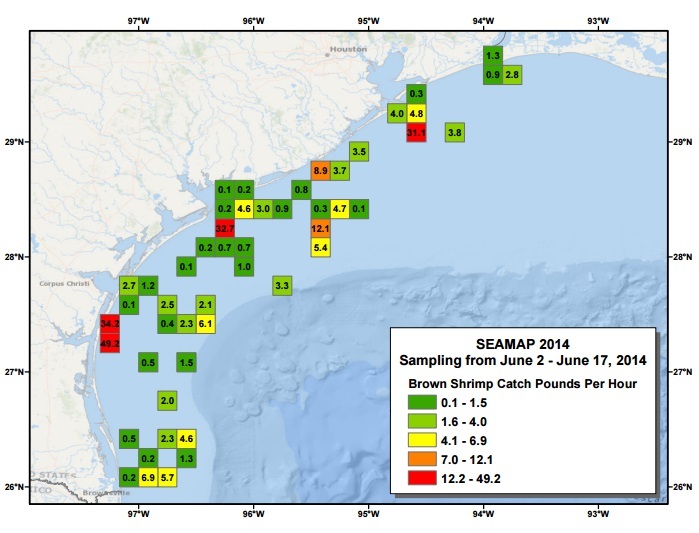 This is completed for 200 individuals in each commercial shrimp category, and real-time data is distributed weekly (see SEAMAP Real-Time Plots). This data is of incredible importance to the commercial fishing industry, especially considering that the season-opening is in late July. 2) Plankton are drifting animals, protists, archaea, algae, or bacteria that live in the ocean water column and cannot swim against the current [Source — Plankton]. Regarding plankton data collection, the Oregon II houses two types of collection nets — dual bongos and a neuston net. As many plankton are microscopic in size, these nets contain a very fine mesh. The dual bongos are used to sample the water column at an oblique angle, while the neuston net is used to collect surface organisms (“neuston” is a term used for organisms that float on top of the water or exist right under the water surface — see Neuston). This data is used to “build a long term fishery-independent database on the resource species important to the economy of the Gulf of Mexico” [Source — NOAA Plankton Surveys]. 3) The third mission of the survey is water column environmental profiling. These profiles are completed using a CTD (conductivity-temperature-depth) device, which is sent back and forth between the surface and the ocean floor (the entire water column) and allows for the collection of real-time data. The main focus of this survey is the measuring of dissolved oxygen levels in the water to identify and monitor areas of hypoxia. In aquatic ecosystems, hypoxia “refers to waters where the dissolved oxygen concentration is below 2 mg/L. Most organisms avoid, or become physiologically stressed, in waters with oxygen below this concentration. Also known as a dead zone, hypoxia can also kill marine organisms which cannot escape the low-oxygen water, affecting commercial harvests and the health of impacted ecosystems” [Source — Gulf of Mexico Hypoxia Watch]. NOAA has partnered with the National Coastal Data Development Center (NCDDC) and other agencies to centralize this data, which has been collected and analyzed for 15 years. This summer’s survey is quite important, as the large amount of rainfall over the past two months could have significantly affected levels of dissolved oxygen in the ocean, and accordingly, zones of hypoxia. 1) Learn as much as I can about the biology I encounter, especially in terms of taxonomic classification and biodiversity. This will be directly applicable to the biodiversity unit and project in my Planet Earth class. 2) Understand in detail the methods by which NOAA real-time data is collected, plotted, and presented to the public. This will be directly applicable to updating the data analysis and presentation portions of the biodiversity project in my Planet Earth class. 3) Upon my return, create a project-based activity for my Planet Earth students, based on the research I conduct aboard the ship. Students will use the real-time data from my leg of the survey (to be posted online) to come to conclusions regarding the biologic and environmental profile of the Gulf of Mexico. This will become part of the Planet Earth course unit global biodiversity. 4) Present my research experience and resulting project-based curriculum to the science faculty of LASA High School, emphasizing the value of research-based activities and projects in high school science. That’s it from me. My next post will be from the Gulf of Mexico! This entry was posted in 2015, David Walker, NOAA Fisheries Service, NOAA Teacher at Sea and tagged CTD, Gulf of Mexico, NOAA Teacher at Sea, Oregon II, plankton, SEAMAP, shrimp. Bookmark the permalink. Enjoyed reading your intro and will be looking forward to reading about your trip. I was a TAS on the NOAA Ship Oregon II last summer. You will have a great experience and meet some wonderful people!